But let’s look at the question of the hour… ….and look at what one long-time. 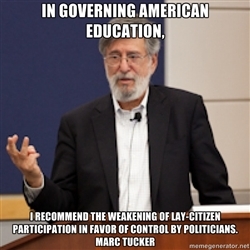 …long, long time… education-and-the-economy expert, Mr. Marc Tucker, had to say. Thankfully, Gallup (on their own without PDK) continued their tradition of asking parents about their satisfaction with their own schools. 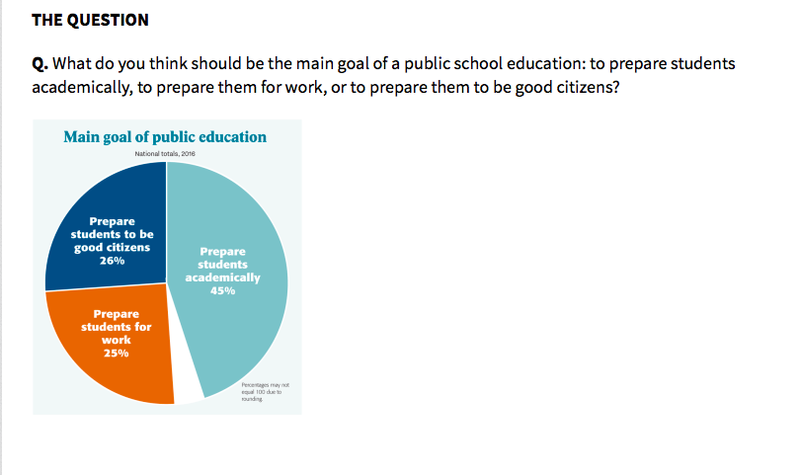 With 76 percent of parents satisfied with their child’s education, isn’t it time we asked; what are we reforming? And how is it we are changing the whole system and not focusing on what needs fixing (23%)? And the opportunity to address accountability issues within a local network. Let me use Idaho as an example. Voters – the People – rejected a “pay-for-performance” law. In the process, the Idaho legislature ordered a study looking at issues that affect our Idaho teachers and schools. 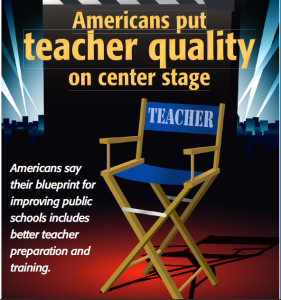 When they looked at teacher preparation (summary, pgs. ix-x), three requests for improvement stood out — all having to do with teacher’s opportunities to learn and resources, some of the same things the students need. We don’t have to look far for solutions. But Idaho ignored their own research to continue on the path of standards, testing, and teacher accountability tied to student outcomes (standards-“based” education, outcome-based “reform”). Our whole nation does not have to make that same mistake. We have an instrument for improvement – federal education law – that was called No Child Left Behind (ESEA). It became the Every Student Succeeds Act (ESSA) in 2015 without fixing what was wrong with NCLB. What must be known is that the Elementary and Secondary Education Act (ESEA) was not intended to be an accountability law. It was to strengthen and improve the education of all those involved with educating children. Better “public” education will make a better public school system. 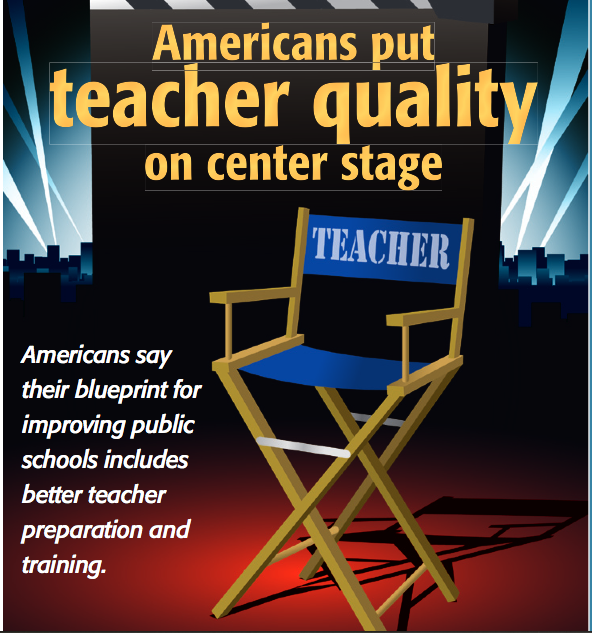 But before we go putting teacher preparation on center stage, let’s be fair. We need “opportunity to learn” indicators for teacher preparation and continuing education in place FIRST. Measurements matter, right? Repeatedly, parents have voiced their support for their own child’s teachers and they trust them. Will lawmakers continue to ignore the People’s voice? Part 2: Propaganda With a Purpose? Like all the official Marc Tucker position papers I’ve read, “Fixing Our National Accountability System” begins with testimonials. This round of accolades begins with former Massachusetts Commissioner of Education, David Driscoll, who is urging us to “stay the course” with Common Core without being clear about any good reason for the yearly testing associated with it. But there is no doubt that his opinion continues to be revered based on his former position even though Massachusetts winning standards were developed before his reign and he left that job before Common Core came into play there. In endorsing Common Core, Driscoll seems to have changed his tune a bit from the time when he thought testing in 4th, 8th, and 10th grade was enough AND that it was important that everyone be able to see the tests (2001). “We released the entire test so that everybody can see the test….And we think this is enormously important. Driscoll clearly supports test-based accountability and supports Tucker’s positions. Is he unaware that teachers are not allowed to see the Common Core tests? Has he not thought about the “adaptive” nature of the online testing system limiting the ability for any adult to know for sure what the testing companies have decided to ask? But Driscoll speaks in favor of Tucker’s plan by calling it a “fact-based way forward” on accountability. Jump aboard the bandwagon! Time for action! The theme of “Fixing” is based on taking teachers from being treated like “blue-collar workers” to a “professional system of accountability.” But neither of Tucker’s analogies resonates with me. Actually, they struck a sour note. I was raised in blue-collar country and I’m now a professional. Tucker missed the mark on understanding the essence of either of these groups of people but his words do have that certain “plain folks” appeal when read superficially. For me, his words are condescending and insulting. My “blue-collar” friends are hard-working honest people that know what its like to put in a good days work. I’m glad I was brought up with those values. Tucker seems to think hard workers need to be “held accountable.” He seems to lack any comprehension of how productive American workers are in general. Rarely must they suffer “consequences” for their actions. And to have Tucker go on to talk about how other countries “manage” their professionals? WOW! He has not deviated from his view that we are all just human capital ready to be molded to suit the needs of “the economy.” Oh Dear Hillary, some things never change! Professionals hold themselves to a professional standard of practice. 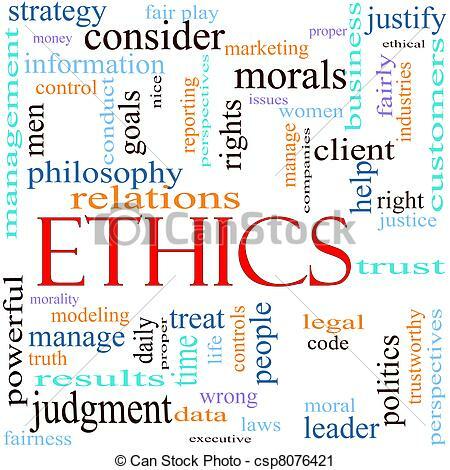 It is an internal human trait that the selection process, education and training, and continuing education of a profession are designed to identify, firmly establish, and foster. 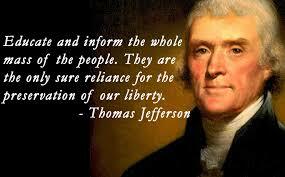 Rarely is government needed. The “bad apples” are the exceptions and the professions have their mechanisms in place to address those relatively rare issues. And this Tucker paper did not start off looking like a “fact-based” plan. It reads like it was meant to give the impression that Tucker is against test-based accountability. The stage is set by bad-mouthing No Child Left Behind (not that it doesn’t deserve it). Tuckers’ words flow with the prevailing winds and if people don’t know any better, it reads as if Mr. Tucker himself had nothing to do with any of this. It is patronizing. that it was not the teachers, but rather the public, school boards and the Congress that maintained for years a schools policy based on the use of cheap teachers, a policy that placed little value on teachers’ skills or mastery of subject matter, and deprived teachers of any hope of a real professional career in teaching and of any chance of gaining the kind of status enjoyed by high status professionals in the United States. No! Children did not get what they deserved. Testing tests and taking tests limits their precious instructional time. Mr. Tucker pushed the outcome-based theory and pushes for “better” testing. So what is truly ironic is to see him now blame everyone else. Ironic, pathetic, or just a ploy? This reeks of propaganda with a purpose. 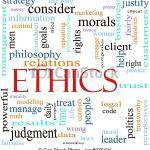 I hope people will see through the new soft sell PR for Common Core and test-based (outcome-based) accountability. But to give Driscoll the benefit of the doubt about this being “fact-based,” I’ll dig further into the “facts” behind “Fixing Our National Accountability System”…. another day, soon. We ask for common sense to be used. We seek common ground. Most of us have a need to be part of a community; we search for commonality with someone. The word “common” has a softly seductive appeal that brings to mind a sense of belonging as though we are sharing something of value. Some of us can’t help but see patterns common to our still-fresh experience with state standards and No Child Left Behind. As standards were demanded as part of an accountability scheme, children were put in harms way in an unprecedented experiment in education reform. If the child didn’t fit the standards and how they were being implemented, many parents and grandparents opted to teach the children how they knew better fit their needs. I know I did, as did others I know who hired tutors or entered their kids in “programs” to fill the gaps. How can we possible judge a system, a school, or a teacher based on this? The sell job of outcome-based accountability was in the wording: want “better student outcomes,” “higher achievement,” to “leave no child behind,” like the idea of “accountability, flexibility, and choice”? …yes, yes, yes, yes. Now, a return of some of what was taken away by Round One — critical thinking and writing through more project-based activities — is the commonsense carrot enticing us to swallow the whole Core National Curriculum. Billed as “new” and “unique,” The Core is neither. Promising to bring “success” and make students “college and career ready,” it is more certain to sell new curriculum materials, new tests, and new remedial materials and programs when students “fail” the tests…and the pattern continues. Parents, if you are “supplementing” your child’s education, your child in particular should be opted out of the testing. If this national experiment is to go forward, it should be based on an honest evaluation. My own opinion — for what it is worth — at The Core of this issue is not our agreed need for some commonality of knowledge; at The Core is conformity. Narrowing of the curriculum was no little glitch. Unintended in Round One; no doubt foreseeable in Round Two.